C.H. Robinson Worldwide is one of the largest global third party logistics companies specializing in offering customers integrated systems and personnel skilled in the efficient movement of goods. C.H. Robinson operates a capital light business model by purchasing cargo space from trucking firms, railroads, airlines, and ocean shipping lines and reselling space to its customers. Charles Henry Robinson founded the company in 1905 as a specialty distributor of perishable products. The company still operates in the produce sourcing business today although it represents a minor percentage of revenues. In a number of respects, C.H. Robinson’s business model is similar to Expeditors International, profiled earlier this month, but is more focused on domestic shipments transported via trucks and railroads. In contrast, Expeditors specializes in the international transportation of goods via aircraft and ocean liners. However, C.H. Robinson has been moving into international freight forwarding in recent years. The 2012 acquisition of Phoenix International increased the company’s international exposure. This article takes a look at C.H. Robinson’s business model and recent operating results. The basic economic value proposition offered by C.H. Robinson is not that different from what Expeditors International provides. Customers in need of shipping services can achieve economies of scale by partnering with a third party logistics provider. Sophisticated information systems optimize the movement of freight and, when multiple customers are involved, C.H. Robinson can consolidate shipments, obtain favorable pricing from carriers, and pass along part of the savings to customers. In this way, C.H. Robinson earns a margin and customers pay less for transportation services than they would if contracting with shippers directly. For analytical purposes, is important to look at the company’s net revenue as opposed to total revenue. Net revenue represents total revenue less purchased transportation services and is the primary indicator of the company’s ability to add value and realize a margin in exchange for providing service to customers. One notable aspect of the company’s performance is that net revenues posted a small increase in 2009 while total revenue fell 12 percent. This is due to the direct costs of procuring transportation falling along with overall volume and demonstrates skillful management during the recession. The exhibit below shows total revenue along with the direct costs of revenue. The difference, shown as the blue area in the chart, represents the company’s net revenue. The company operates in a single segment but provides a breakdown of net revenue by service line. The exhibit below shows the company’s net revenue broken down by service line over the past ten years. The sourcing service line represents the company’s original business of sourcing and transporting fresh produce and perishable goods. The payment services line was consolidated into transportation starting in 2015. Figures are in thousands. Two major acquisitions impacted results in recent years. In 2012, the company acquired Phoenix International for $560.8 million. The purpose of this acquisition was to increase C.H. Robinson’s presence and service offerings in international freight forwarding. The acquisition was made toward the end of 2012 so we can see the additional ocean, air, and customs related net revenue starting in 2013. On January 1, 2015, the company acquired Freightquote for $398.6 million. Freightquote is a freight broker specializing in less-than-truckload (LTL) shipments. 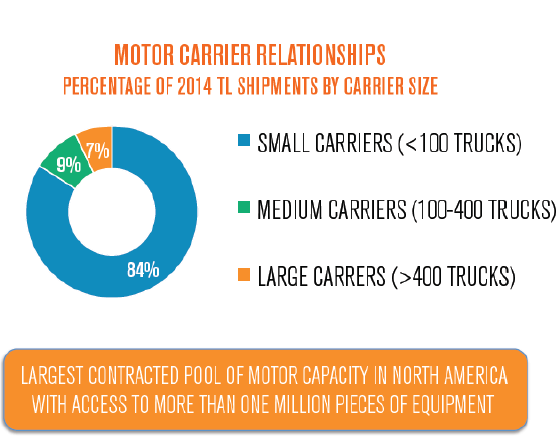 Most of the increase in the LTL category in 2015 is attributable to this acquisition. With 74 percent of net revenue attributable to truckload and LTL shipments, it is evident that C.H. Robinson’s mix of business is quite different from Expeditors International which realizes 59 percent of net revenue from air and ocean shipments with the balance from customs brokerage and other services. C.H. Robinson clearly provides a good value proposition to customers that allows the company to sustain healthy operating margins in a variety of economic environments. Income from operations was 37.8 percent of net revenue in 2015 while net income was 22.5 percent of net revenue. There has actually been a slight decline in both operating and net income margins over the past few years which could be attributable to the incorporation of acquisitions. The exhibit below shows key performance figures over the past decade including productivity data on a per-employee basis. One interesting aspect to note for C.H. Robinson is that the employee productivity figures appear to be more favorable than the corresponding data for Expeditors International (which are not displayed in the table). For example, personnel expenses as a percentage of net revenue tends to be in the mid 40 percent range for C.H. Robinson and in the low 50s for Expeditors. Expeditors has a lower operating margin compared to C.H. Robinson. It is possible that the difference is attributable to the different mix of business (domestic land-based shipping vs. international ocean/air based shipping). C.H. 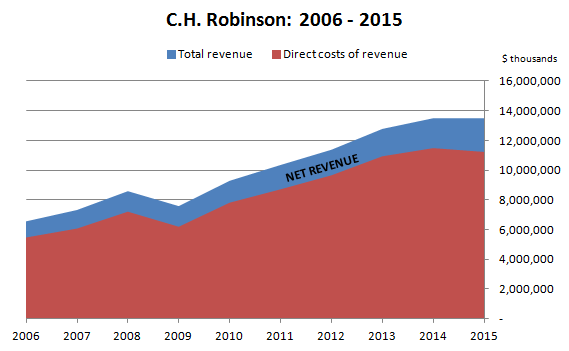 Robinson has an enviable record of cash flow generation. Over the past decade, the company has posted net income of $4.1 billion, cash flow from operations of $4.3 billion, and free cash flow of $3.9 billion. 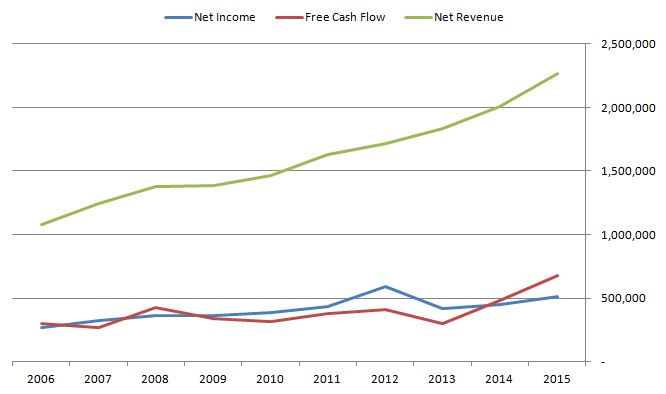 As we can see from the exhibit below, free cash flow tends to approximate net income over time (figures in thousands). Over the past decade, the company has returned $4.3 billion to shareholders in the form of repurchases of $2.5 billion and dividends of $1.8 billion. This has exceeded free cash flow generation over the period and was partially funded by taking on a modest amount of leverage. The company has also employed leverage for the cash component of its acquisitions in recent years. Net cash invested in acquisitions (acquisitions less proceeds from divestitures) was $822 million over the past ten years. According to a recent investor presentation (pdf), management intends to target the dividend payout ratio to 40-50 percent of net income. 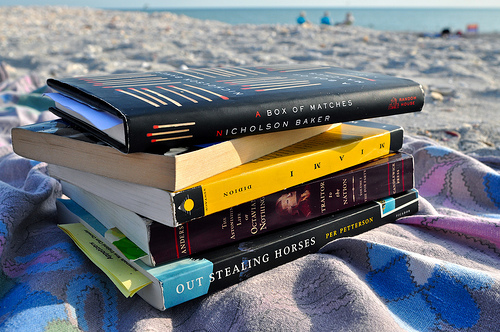 Share repurchases will bring the total cash return to approximately 90 percent of net income annually. In addition, management is looking for additional strategic acquisitions. During the Q4 2015 earnings conference call, management indicated that leverage in the range of 1.0-1.5x debt-to-EBITDA will be targeted in the long run leaving room for significant additional debt in the targeted capital structure. C.H. Robinson clearly has a powerful moat that has endured through all kinds of economic conditions. Perhaps the best evidence of the moat is revealed by examining the company’s record during the 2008-09 recession. Although total revenue declined in 2009, the company posted a slight net revenue gain. All of the important performance metrics such as operating margin held up extremely well during the worst economic crisis since the Great Depression. This is really quite remarkable for a company that is seemingly very exposed to the domestic economy. Approximately 84 percent of truckload shipments in 2014 were with motor carriers that had fewer than 100 tractors (this figure was 83 percent in 2015). In 2015, C.H. Robinson worked with 68,000 transportation providers worldwide. In general, C.H. Robinson represents a very large customer for motor carriers and the company is not dependent on any trucking firm. The company’s information systems are capable of identifying an appropriate carrier based on the customer’s shipment and coordinating complicated aspects of the shipment with the carrier. This “middleman” service saves the shipper the hassle of trying to identify and negotiate with an appropriate carrier directly. Also, the buying power of C.H. Robinson will usually result in lower costs for the shipper. Switching costs also play a role in the maintenance of the moat. C.H. Robinson maintains information systems that can be integrated directly into the systems of its customers. As customer information systems are developed with integral links to C.H. Robinson, the costs of switching the workflow to another carrier increases. Barring a major disruption, customers have little incentive to “rock the boat” by switching. C.H. Robinson’s small sourcing business known as Robinson Fresh also enjoys similar economics. The company has relationships with more than 2,000 growers and transports 120 million cases of fresh produce annually to end customers. The practical obstacles facing thousands of smaller growers trying to get perishable products to market in a timely manner are very clear. One potential competitive threat on the horizon could involve Amazon.com. In recent years, Amazon has taken on many of the characteristics of a third party logistics company. In particular, Amazon now facilitates the sale and transportation of goods between a large number of third party merchants and end customers. The company has a history of disrupting industries and management has historically not been reluctant to enter adjacent markets with little regard for short term profitability. A recent article in an supply chain industry publication provides more details regarding the potential threat from Amazon. Despite the nascent threat from Amazon, it remains likely that C.H. Robinson’s moat will be sustainable. Although growth through acquisition has inherent risks, growing the scale of its operations should be a priority for management. As the scale of operations increases, the company should enjoy greater pricing power when negotiating with customers as well as better rates when negotiating with motor carriers, railroads, airlines, and ocean shippers. C.H. Robinson’s business success has not been ignored by investors. Historically, the stock has not traded at bargain basement levels and shares recently traded at around 21 times 2015 net income. Market capitalization is approximately $11 billion. Despite the presence of a moat, the company does not have particularly strong reinvestment opportunities given the capital light business model. This is implicitly conceded by management given a goal of distributing 90 percent of net income to shareholders. However, growth through acquisition is possible and management’s goal of diluted earnings per share growth of 7-12 percent could be achievable. Over the past decade, earnings per share compounded at 9.7 percent. The current dividend yield is 2.3 percent. If C.H. Robinson can compound diluted net income per share at the low end of management’s guidance (7 percent) over the next decade, earnings per share should be close to $7 by the middle of the next decade implying a stock price of around $140 assuming no multiple compression. After considering the dividend, investors could expect annualized returns in the 9 percent range. C.H. Robinson appears to be an excellent business available at a reasonable, but not bargain basement, price. However, as the chart above shows, the stock price is more volatile than the business and occasionally badly overreacts to economic conditions that have not historically harmed the company in any measurable way. C.H. Robinson deserves a place on a value investor’s watch list for a potential bargain purchase at times when Mr. Market puts the shares on sale. This article does not incorporate first quarter 2016 results which were released after the market closed on April 26 (slides for the earnings call scheduled for April 27 were also released). C.H. Robinson posted a total revenue decline of 6.9 percent to $3.07 billion but net revenue increased by 7.3 percent to $563.3 million. Operating income and net income increased by 9.4 percent and 11.7 percent respectively while diluted earnings per share was up 13.7 percent to $0.83. Analysts had expected earnings per share of $0.82 so the company “beat” that expectation. However, total revenue of $3.07 billion fell short of analyst expectations of $3.2 billion sending the shares down around 5 percent in extended after hours trading. It is not clear whether the company also “missed” net revenue expectations or if market participants noted that net revenue increased 7.3 percent even as total revenue declined. In any case, as suggested above, market volatility could create opportunities for long term value investors.